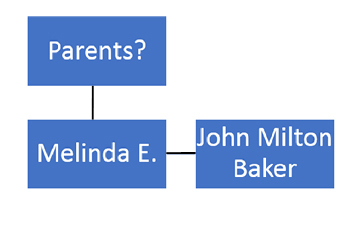 It stands out there, in The Legal Genealogist‘s database. The birthdate, given in detail, as March 4, 1859. And the name of the person born that day: Melinda. Maybe Malinda. Or something like that. Her married name: Baker. Not much of a surprise, given the size of my Virginia-to-North-Carolina-to-everywhere-else-in-the-south Baker family. Even date and place of death? But… sigh… that’s pretty much where my database entries end. I never followed up to tell the story of this woman as a full person in her own right. I wish I could say this stands out as an exception. But it’s not. So many of the collateral relatives in my database remain sketchy figures in need of some tender loving care. It’s going to take a long while before I can begin to feel comfortable with what I have done on so many of the members of my family. But I can begin to right the wrong with the woman that my database says was, simply, Melinda Baker. The North Carolina marriage index records the marriage of J. M. Baker and “Malinda Gillan” on 1 December 1873 in Buncombe County, North Carolina, performed by a Justice of the Peace, J. W. Walker.7 That’s pretty close to what I’d expect for this couple: the first name is close to that of John Milton Baker’s wife in the 1880 census, and the marriage date is right given the 1874 birth of their first child. But was she Malinda Gillan? There aren’t any Gillans in the 1870 census of Buncombe County, North Carolina. Not even many Gillans anywhere in the United States in that census.8 So… is the name recorded correctly? Could she have been Malinda Gilliland? No, a genealogist’s work is never done, but I’ll bet you did the happy dance when you found those death certificates!! But of course!! Sure was glad to see them!! I’m glad you eventually figured out Malinda’s maiden name. Could you also discuss the flip-side of this issue – when you know the maiden name, but don’t know the married name? Often I find a woman in a census in her birth household, but she then “disappears” – it’s hard to figure out if she died or got married. Yes, it sure is hard and may often take a lot of effort: finding her in other records, like her father’s probate record, with a bequest to FirstName MarriedName. An excellent example of my daily search. I tried to resolve these maiden names, with one or more such searches under way at all times. Like the way you build your story around your searches and what you find (or do not find). I do say you show a twisted path to results. I thought after the first couple of paragraphs it was deadendsville, but you kept digging. I’m dozing off after a couple hours. So then I ask wife to take over. She does not quit until she hits the stop sign at the end of the internet! What a great story! Shows what persistence and thinking through some alternative ways of searching can give you. I agree with Mary Ann in an earlier comment that a happy dance is definitely warranted here! Definitely a happy dance situation — but yes, looking at alternatives is almost always going to produce some answer. You might glean further info on the descendants of Alney/Alsey/Allen and Betsy Gilliland [and variant spellings] from a Buncombe case appealed to the NC Supreme Court. At the very least, you’ll find it interesting reading. “Sylvia Gilliand et al vs. Buncombe County Board of Education, 1905” in A Lot of Bunkum, volume 25#4 [November 2004], pages 11-18. Staley suggests that plaintiff Sylvia Gilliand’s father, Robert, was a son in the household of Allen [sic] Gilliand in 1880 at Averys Creek, Buncombe County, NC. In her abstraction of genealogical material in the case, she indicates that Robert Gilliland [sic] was son of Allen [sic] and Betsey Suttles Gilleland. Staley also mentioned that the case was listed in Westlaw.